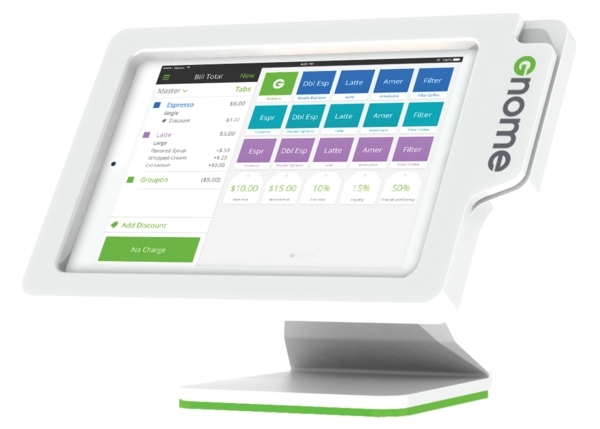 Flash deals company Groupon on Monday unveiled Gnome, an iPad-based point-of-sale console with deep integration into Groupon's own infrastructure that the company hopes will spur uptake among merchants that regularly run promotions through the service. Many of Gnome's features are designed to make it easier for merchants to administer Groupon campaigns. Those with Groupon's app installed on their phone, for instance, will automatically be recognized as they enter the store, allowing them to redeem their purchase without a printed receipt or pulling out their handset. Additionally, the system can function as a standalone POS, able to log transactions with cash or via credit or debit cards. This mode —which functions much like rival Square's Square Register product —gives merchants the ability to issue printed or emailed receipts, calculate tax, and manage inventory. Furthering comparisons to Square, Groupon will also provide payment processing services through Gnome. The company will charge 1.8 percent plus 15 cents per transaction —in addition to the $10-per-month Gnome fee —for that service. "When it's complete, Gnome will serve as an operating system for merchants to run their entire operation and enable them to create real-time promotions that bring customers into their business when they need them the most," Groupon CEO Eric Lefkofsky said in a release. "Gnome is an important step towards our long-term mission of creating a world where merchants are constantly connected to the Groupon local commerce platform." Groupon says they expect Gnome to roll out to "tens of thousands" of merchants this year.